In 2016, 37% of the world’s beauty and personal care launches with anti-ageing claims were launched in Asia Pacific. Two in five (39%) urban Chinese female consumers aged 20-24 use anti-ageing skincare products. Anti-ageing facial skincare launches with an anti-pollution claim saw a 15% rise in Asia Pacific from 2015 to 2016. Asia’s ageing population continues to grow at an unprecedented rate, and the beauty industry has taken notice of this shift in demographics. 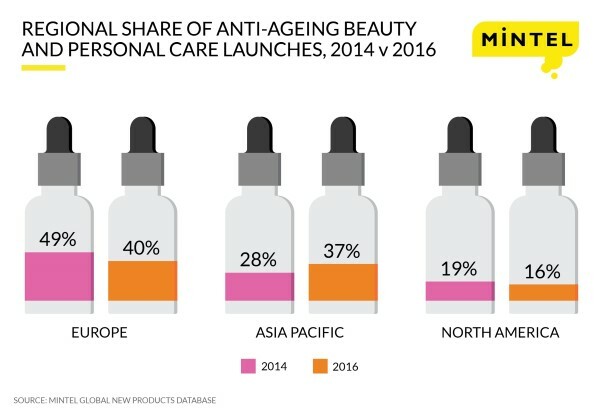 New research from global market intelligence agency Mintel reveals that, in 2016, over one third (37%) of global beauty and personal care (BPC) launches with anti-ageing claims were launched in Asia Pacific (APAC), up from 28% in 2014. This makes APAC the second most active region for anti-ageing BPC innovation after Europe (40%), according to Mintel Global New Products Database (GNPD). In APAC, South Korea and Japan are leading the charge in anti-ageing BPC launches, each country accounting for 23% of APAC anti-ageing BPC launches respectively between 2014 and 2016, according to Mintel GNPD. Ranking third for anti-ageing BPC products is China at 22%; Thailand comes in fourth at 7%, and finally, India at 6% – rounding up the list of top five Asian markets for anti-ageing BPC innovation. Globally, the United Kingdom (UK) takes up the largest share of the pie, accounting for 16% of the world’s BPC innovation with anti-ageing claims between 2014 and 2016. Comparatively, in the same time period, South Korea and Japan each account for 8% of all global anti-ageing BPC launches respectively, and China at 7%. While the UK leads globally, Mintel GNPD reveals that anti-ageing BPC innovation in the country has seen a year-on-year dip: 19% in 2014; 17% in 2015; and 12% in 2016. Meanwhile, it seems that the concept of ageing has infiltrated the younger population. This has given rise to the ‘early anti-ageing’ trend where younger consumers are starting to use anti-ageing beauty and personal care products that act as a preventive measure against early signs of ageing. Indeed, research from Mintel reveals that as many as 30% of urban Chinese consumers aged 20-49 describe their current skin condition as showing early signs of wrinkles or lines, while 39% of Chinese females aged 20-24 report using anti-ageing skincare products. In Thailand, 45% and 48% of metro male consumers aged 18 and over are concerned about the appearance of wrinkles and age spots respectively. “An even skin tone that’s free from age spots and wrinkles has long been considered the ‘ideal’ among many in Asia. It is this quest for the ‘ideal’ that is encouraging younger Asians to use skincare products to delay and combat early signs of ageing. Younger consumers are increasing their use of anti-ageing products and brands can successfully appeal to this target market by offering anti-ageing solutions that address the lifestyle and environmental stressors to which they are commonly exposed.” Sharon continues. Finally, Mintel research reveals that over half (55%) of urban females in Thailand think that the environment – including pollution – plays a part in the appearance of skin. What’s more, environmental concerns have led to the addition of new protection claims within the anti-ageing BPC space, particularly against pollution. According to Mintel GNPD, launches of anti-ageing facial skincare products with an anti-pollution claim increased from 20% in 2015 to 35% in 2016 in APAC. “Anti-pollution has been a hot topic of late and the possible effects of pollution on the skin’s health – such as the acceleration of ageing – are recognised by many across the world. The time is ripe for beauty and personal care brands to align with this by innovating and launching anti-ageing beauty and personal care products with protection claims.” Sharon concludes.